About Merry Christmas to all my Orthodox friends ! Mir Bozji, Hristos se rodi ! Sretan Bozic ! Hvala najlepse :) Cuvaj se. congratulations my dearest Srna for the well deserved award!!! Heart felt thank you my dearest Salvador, all the best to you and God bless you and all Catholic brothers and sisters. All the best to you and to all the Orthodox brothers annd sisters. 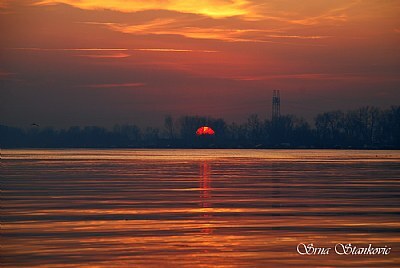 A very lovely image of the fading sunset dear Srna. Loved the strong warm hues and colors. Very romantic and dramatic. Thoughtfully composed with excellent lighting and reflection play off the water. Very good visual and initial impact. Good techniques and high technical excellence. Well done and well deserved award my friend! Well noticed Paul and thanks for your kind appreciation. Thank you very much Serge for your kind appreciation and lovely observation. Appreciated just as always. Yes, I should have done the same, agreed with what you should have done ... thought the horizon is straight and the tower of power did not destroyed the atmosphere on the first sight, this is why I uploaded this photo this way. You've changed the words then. The song I know is Good Morning Mr Sunshine.... you brighten up my day. I'd shift horison line up a little. And delete tower of power, it distracts, destroys the atmosphere of the frame. Beautiful silhouette, excellent colour, the red beam of reflection of the sun is quite unique. The lines on the water surface is also very impressive. Finally a very good presentation. Vaistinu se rodi. Sretni Bozicni praznici tebi i tvojima, sve najbolje. Belíssimo trabalho, captura , composição e cores da foto estão excelentes. Cumprimentos. Indeed it is born... The lanscape exudes the beauty of the setting sun, with a bautiful reflections in water. Blueness of the forest, the birds in the left cornet of the pillar on the right provide stability. Excellent Srna. What a moment, just perfect for Serbian Christmas dear Srna.